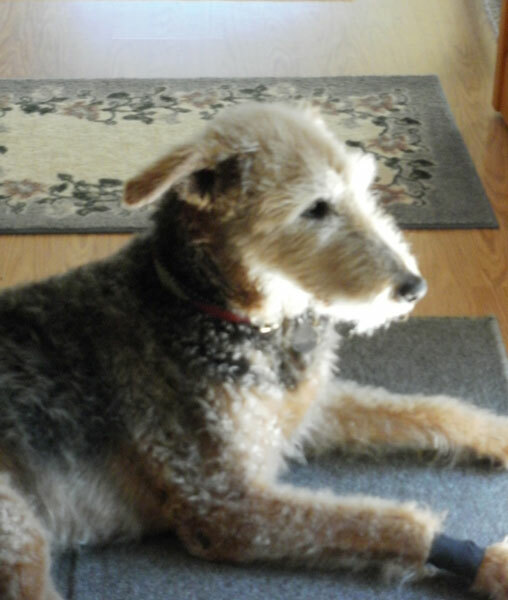 My dog Cassie, an energetic Airedale with a nose for window painting, is my partner in my digital art. We have a blog, www.airedale-art.blogspot.com , which explains how the work happens. FYI: our team name is "PiCassieO". Some of Cassie's exuberant markings actually resemble paintings by Picasso, at least in my opinion. He was almost as playful as an Airedale! "Cassie-O" is one of my dog's many nicknames, so our team is named for an artist (representing me) as well as the Airedale-in-charge. Below is one of our first efforts: it's called "Cassie's Nose Garden." 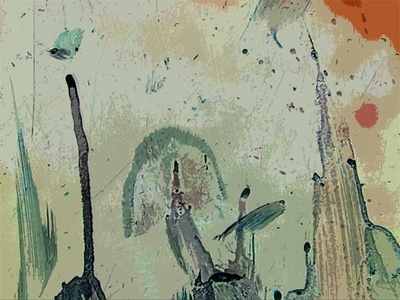 Our digital art ranges in appearance from intaglio to serigraphy to drybrush, with a lot of in-between. She "paints" the windows with her nose (and occasionally gets in a few licks as well), and I photograph the marks. Then I process the work in PhotoShop, cropping and composing, sometimes drawing over with a stylus, and then enhancing with various filters until I'm satisfied with the appearance. My job in this team is to be Cassie's interpreter! She gives me unlimited license to play with her images, which is really liberating and a lot of fun. The prints are featured in my "Digital Art" Gallery page. UPDATE: My beloved art partner Cassie died on September 22, 2012. She was my teacher as well as my best friend. I have many photos of her "nose art" that I haven't explored yet, so she will live on in our art as well as in my heart.